Even if our business is such a small industry, we have always been mindful of protecting Mother Earth. As we became more educated in the ways of business and handmade paper production, our biggest challenge was how to make a viable and affordable wastewater management system. It took us almost 15 years of searching, but finally, after a visit in 2003, the Ten Thousand Villages of Canada gave us an unasked-for grant of about US$6,000. We used this entirely for the development of our wastewater treatment facility, which complies with the standards of the Department of Environment and Natural Resources (DENR). We feel this is our greatest gift, because it helps us realize our mission of giving livelihood to our people, and at the same time, be one with our environment. We call our water-purification floating device the “Sputnik Aerator”. In our handmade paper production areas, canals are installed with screens or catchers to collect any solid waste, mostly pulp, that inevitably slip during washing and cleaning processes. Other pollutants include dyes, chemicals, oil, grease, etc. All wastewater from both production and domestic use drain to the collection tank. This wastewater may include solid wastes that are not filtered by the screening process. We add aluminum sulfate (Al2(S04)3) to our coagulation tank so that the tiny solid waste that were not filtered will combine together to become flocs and eventually settle at the bottom of the chamber. Settled solid wastes are collected twice a year. 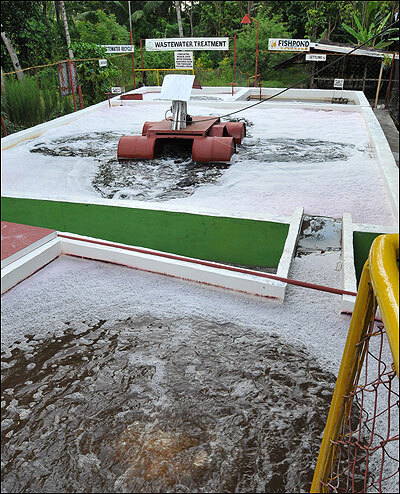 The wastewater then flows into our decolourization tank, where it is treated to ensure the removal of the color from the synthetic dyes we used in the production. The main treatment then happens in the aeration tank. We need bacteria in this stage. The bacteria’s job is to eat the pollutants responsible for making water bad. In order to have bacteria, we need to grow them by providing oxygen and sunlight to the waste water. Constant aeration is needed to support the needed supply of oxygen. This is where the wastewater from the aeration tank is made clearer or purer before the water is acceptable for discharge. Despite the series of treatment tanks, waste water still carries tiny solid wastes, so this tank is basically meant to collect remaining tiny solid wastes. No aeration is needed because the tiny solid waste settles down at the bottom. The discharge wastewater in this tank is now called the treated wastewater or effluent. To certify its safety, we periodically send treated wastewater samples for laboratory testing. We are happy to say that our wastewater reaches the parameters stated below as mandated by our government through the Department of Environment and Natural Resources (DENR) – Environmental Management Bureau. A more natural test we do is using the effluent to supply the water in our fishpond and our gardens. For us, the health and vibrancy of our fish and flowers is proof that our wastewater is indeed environmentally safe!